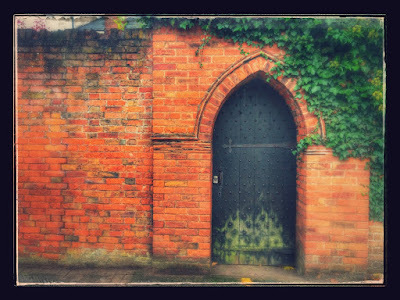 During the weekend, I posted a photograph of a curious gate in the old Friary Wall on the corner of Saint John Street, Lichfield, beside the Library. The photograph attracted a number of interesting comments on a Facebook site and raised a number of curious questions. Another said she could remember going through this gate into the garden behind when she was in the Girl Guides. Johann Popp, who was the proprietor of nearby Saint John’s House when I once stayed there, pointed out that behind the gate is a private garden on the north side of the wall, and posted a photograph of it. 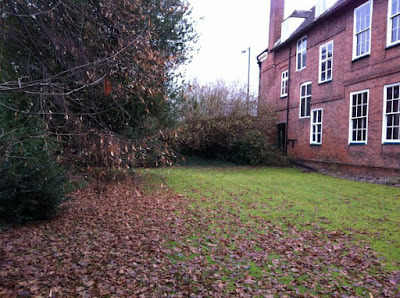 Another person recalled how the gate leads into the gardens of No 20 St John Street, the former offices of Hinckley Birch & Exham where she worked for many years before moving to Ansons in 2010, when Hinckley Birch & Brown merged with Ansons. The house is now owned by Access Bookings. No 20 Saint John Street is an early Georgian house, standing next to the Friary site, and it is easy to pass by without noticing. Yet, as I wrote in a posting earlier this summer, this house is a fine example of a well preserved Georgian house that has survived since about 1700. And so, the secret behind the secret gate is a fine example of Lichfield’s Georgian architectural heritage.